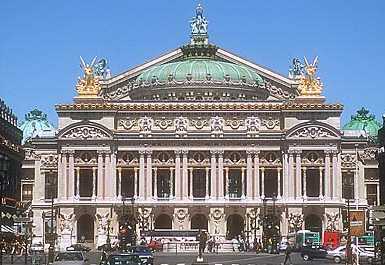 The Opera Garnier was built between 1860 and 1875 in the style of the Second Empire. 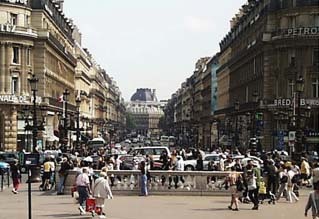 The architect was Charles Garnier. 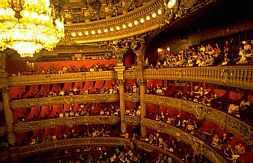 It is the largest opera theatre in the world with enough staging for 450 players. The opera house was constructed above a subterranean river that still runs to an underground artificial lake to this day. The Phantom of the Opera, created by Gaston Leroux, is said to continue his sinister doings down below. The theater is very ornate. The grand escalier leads to the grand foyer. A flight of ten steps leads up to the entrance hall with seven vaulted arcades separated by groups of sculpture. On the landing, the foyer opens on to a loggia with sixteen double columns flanking the french windows topped by busts of composers. Lastly a great carved pediment surmounted by two large bronze groups allows one to see the green roof of the low dome covering the great hall and the Apollo holding up his Iyre above the proscenium arch between the audience and the stage. You can go in and take a pretty good tour if you want to pay the price.